I purchased a painting recently and the edges of the canvas were painted on and it looked fine. But I thought it needed a frame. I wasn’t sure if this would fit the canvas, but your service dept helped me in explaining how the ‘pins’ held the canvas in. The frame arrived promptly and it was so well packaged. Outstanding. I am a very happy customer. Beautiful frame that is well constructed. It arrived quickly and the packaging was amazing. My print looks incredible in the frame, couldn’t be happier. It was almost half the price of a smaller frame at the local craft store. So glad I ordered it! I will definitely buy any large frames from them in the future. Terrific quality and customer service since the initial frame was delivered damaged. 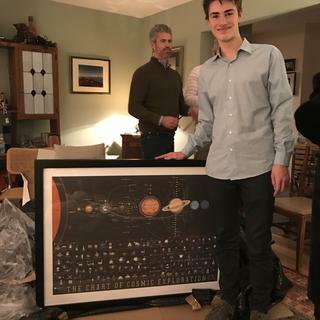 They got me another in time for Christmas since it was to be a gift and I still had to assemble the print, mat, foamcore and glass in the frame. Thank you soooo much for that outstanding service!!! Christmas gift for my grandson. He loved it! Perfect fit. Looks great. Very happy with this frame. Frame came extremely well packaged( I was worried because it was fairly large in one dimension). Quality of the frame materials and assembly was excellent. Black finish was very high quailty.Miters were perfect and it was sized exactly as ordered. It did have a very small chip on one of the edges which I think I can touch up and is no big deal. Perfect frame for a valuable etching print.Came with mounting hardware(used my own) and hanging hardware(used it). 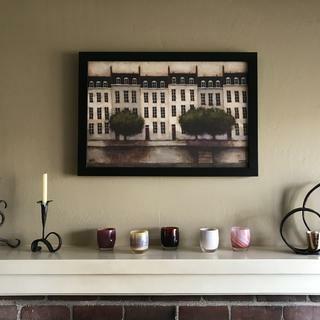 Would definitley order from pictureframes.com again. Great quality - love it! 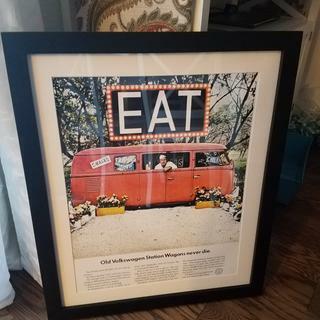 The frame arrived with days after placing order - great service. Love this simple, classic, beautiful frame! Makes my art stand out! This is a simple well made wood frame that is very elegant. The width is perfect for a 24 x 24 inch canvas. It is deep enough to fit a 3/4 inch deep canvas. It doesn't conflict with the artwork. 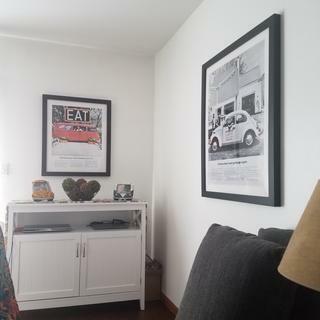 Love these frames for my kitchen artwork. 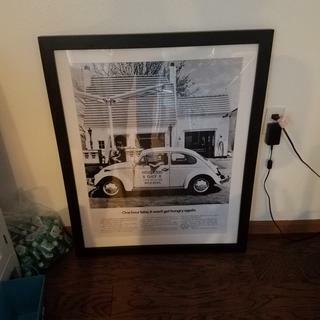 Have since purchased more for my living room decor. Nice frame, very fast delivery. The frame is very handsome on my painting. As always, it was shipped well-protected, and arrived in good condition. I order every frame of mine for work on canvas when exhibiting my artwork from picture frames.com. They are so dependable with their quality products and quick service. The paintings are enhanced by the simplicity of the moldings I select. P.S. as an aside, I found the wood on this frame to be harder (more dense), so it was more difficult for me to make holes for the screws by hand, using an awl and Phillips head screwdriver. I also used 1/8 inch offset brackets to insert the painting, as the clips that arrived were not a good fit for my canvas. Due to shortness of time before exhibit, I did not contact the company for alternative hardware. One corner had a ding in the paint. Seems like they should inspect each frame before it goes out. Hello Nathan. Thank you for your review. We regret to hear that the frame arrived this way. This is certainly not the experience we want for you. Our customer care team is happy to help make this right for you. They are available Monday-Friday 8am-7pm eastern time and can be reached at 1-800-332-8884. I like that it's deep enough for 1/2" cradled board, and looks simple and classic. Just wanted something simple. The artwork is dramatic. A great wood frame at a good price. I have several of these and am happy with all of them. Good ratio of depth and width for a large format print. Matched the frames we already purchased and we where very impressed with the quality and the speedy service. Great Job! I liked the thickness of the frame! Basic frame and good price. It is a simple frame for exhibition purposes, and it looks well proportioned to the painting it will exhibit. 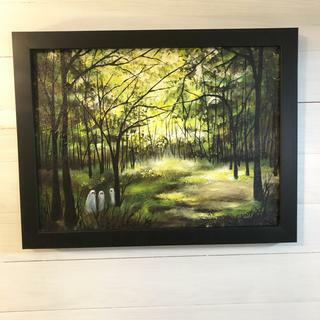 Looking for simple black frame for artwork. Perfect width and finish for gallery presentations. what kind of glass does this come with? BEST ANSWER: Hello Vibeka! 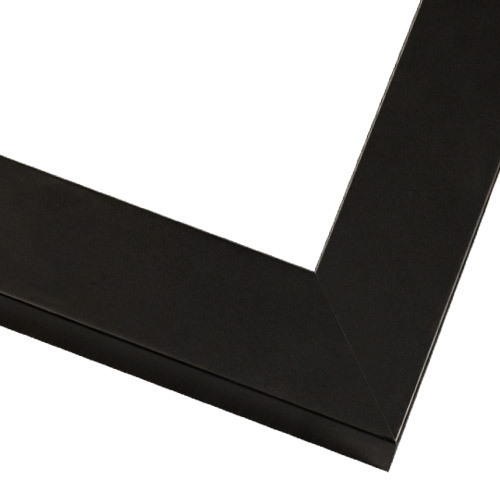 We don’t sell glass for frames, we sell picture-frame quality acrylic which is plexiglass. Glazing and backing kits are not included automatically because not all artwork or customers need them for framing. Canvas paintings, for example, would be damaged by glazing of any kind. These are offered as separate add-on items during the ordering process which can be added after a frame size is selected.If you require glazing and backing kits to complete frames, you can order acrylic and foam core backing on our website in the Frame Shop, or by placing a phone order with any of our Advisors, any time from 8 pm – 7 pm EST Monday thru Friday.Please let us know if we can help further.